The son of a submarine sailor, Paul traveled throughout the United States before landing in Moscow, Idaho to attend the University of Idaho in 1982. He received a Bachelor of Science degree in Business with an emphasis in Marketing in 1986. Paul returned to New England in 1988 to work as a sales associate for Quester Gallery, a maritime art gallery specializing in 18th, 19th, and 20th century British and American marine paintings. In 1992, Paul left the art business for a career in real estate brokerage so he could set his own schedule and go to his kids' games. He began his real estate career with Coldwell Banker, Cahoone Realtors in Westerly. In 1999, he applied and was accepted to Roger Williams University's School of Law in Bristol, Rhode Island. In 2003, Paul graduated from RWU Law and opened his practice on the second floor of the Coldwell Banker building that is his home today. He is admitted to practice in both Rhode Island and Connecticut. 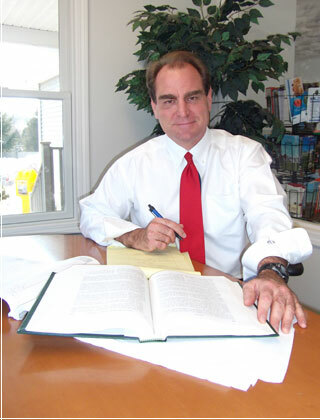 Paul's practice has evolved from a general to a focused legal practice with a strong foundation in all aspects of real estate, contract, property and land use laws. In addition, Paul does a large amount of business formations, including corporations and LLCs, with a special interest in new business start-ups. Lastly, Paul is committed to helping his clients further protect and preserve their assets through proper estate planning. Paul is assisted by the best paralegals in the business - AnnaMaria Antoch and Stephanie Campbell, both who possess a special gift to work efficiently and always with a pleasant disposition, sometimes in a very hectic and pressured environment. Together we work hard and strive to give their clients the best personal service. Paul has two children: Ryan, a 2004 graduate of the University of Idaho and a CPA who lives and works in Providence, Rhode Island, and Sarah, a 2010 graduate of the University of Rhode Island and an RN who is studying to become a CRNA in Asheville, North Carolina. As the son of a career submarine sailor, Paul has a soft spot for veterans and their families and takes a special pride in serving those who serve our country. This site and its information is not legal advice, nor is it intended to be. Until an attorney-client relationship is established, please withhold from sending any confidential information to us.